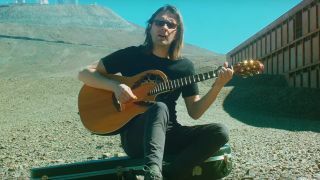 Steven Wilson has released a new video for his track Nowhere Now and has announced that he’ll play a third night at London’s Royal Albert Hall in March next year. The song is said to be a “gloriously soaring paean to the joys of everyday escapism” with the promo shot on location at and around Atacama Large Millimeter Array in Chile. The video was directed and edited by Wilson’s long-time visual collaborator Lasse Hoile. The new show at the Royal Albert Hall will take place on March 29 and will be the former Porcupine Tree man’s third consecutive night at the iconic London venue – and is part of Wilson’s UK and European tour in support of his hit album To The Bone. Tickets for the new show will go on sale from 9am on Friday (September 22) via Gigs And Tours. Find a full list of Wilson’s 2017 live dates below. Media Shouts 'Prog Is Back' As Steven Wilson Charts At No.3!